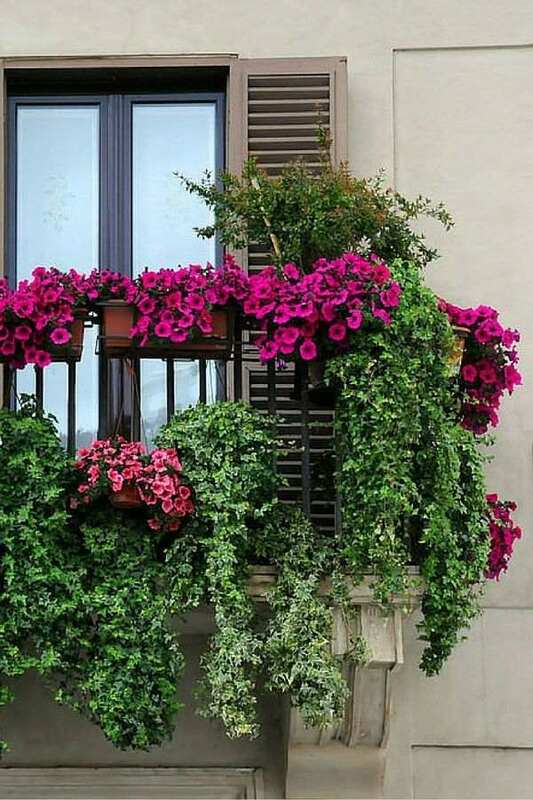 Flowers have a great importance in the design of the balcony. They not only serve as its decoration, but are also able to protect the room from excessive sunlight and summer heat, dust and noise of the big city. 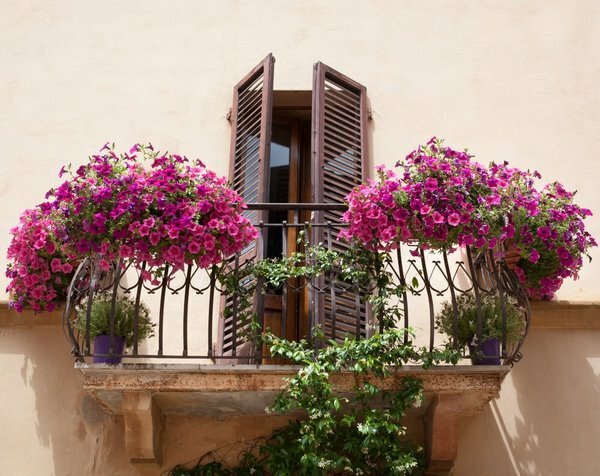 Hanging balcony plants that bloom beautifully and their flowers are like magnificent pops of color against the walls of buildings, making them more elegant and picturesque. 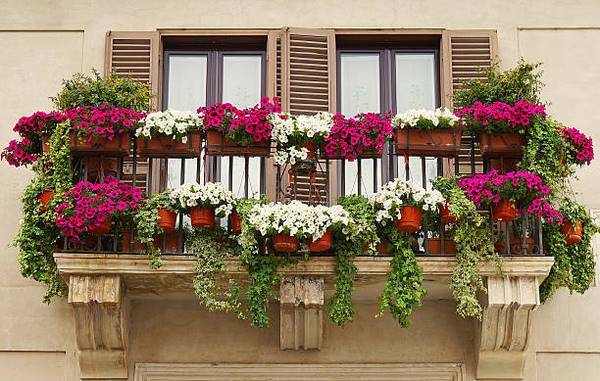 How to turn a balcony into a blooming corner? Which species are suitable and how to take care for them? We shall give you useful information about how to grow flowers on the balcony and how to care for them so that you enjoy your outdoor area all summer long. Before you start creating a flower garden on your balcony there is some work to be done. On the first place you have to clear the balcony of clutter and look if it needs any repairs. Ask yourself how you want the balcony to look like – do you prefer blooming species, green species or you want to have a mixture? Determine the location – not all plants are suitable for each side. Generally, it is better to choose unpretentious annual or perennial plants. Decorative beans, sweet peas, geraniums, petunias, magic bells are a good choice for sunny balconies. Remember that during summer your hanging plants will need a lot of water so watering is recommended twice a day. You may think of self-watering planter boxes or a suitable irrigation system. For shady balconies you need species that are unpretentious and will thrive even with little to no light. These plants should be placed so that they do not block the sunlight. 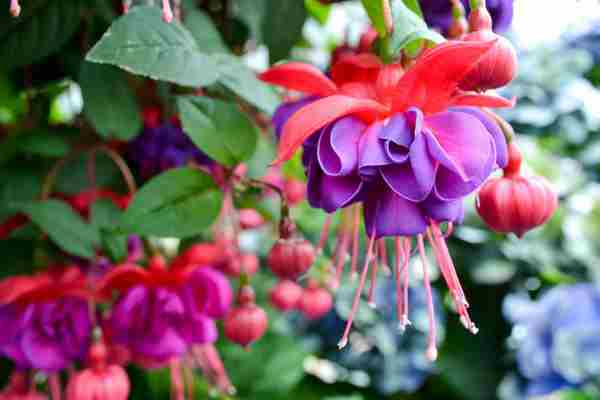 Fuchsia, Coral Bells, Begonia, English Ivy are some of the options to choose from. 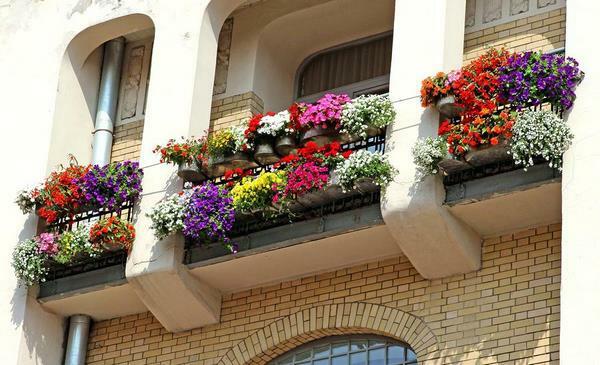 Plan the right planter boxes so that they are suitable for hanging balcony plants. Make sure they have the right drainage to avoid root rotting. Plastic is a good material for containers and is also affordable. Wooden planters can be damaged by moisture. Metal pots and wire baskets are good options as well. Neutral colors of containers will highlight the plants while dark colors attract the sun’s rays and lead to overheating of the soil. 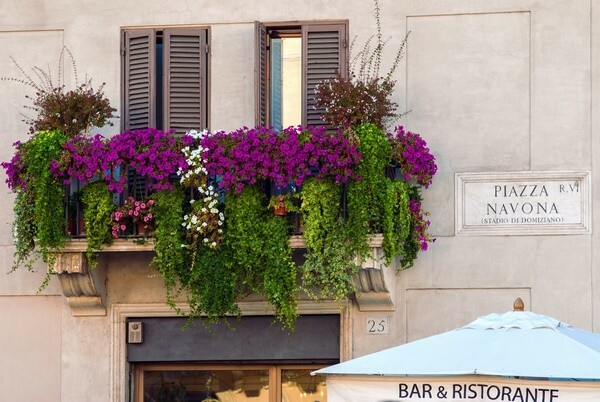 What are the most popular balcony hanging plants? Here are some of the species to choose from which will help you create a beautiful and colorful oasis. 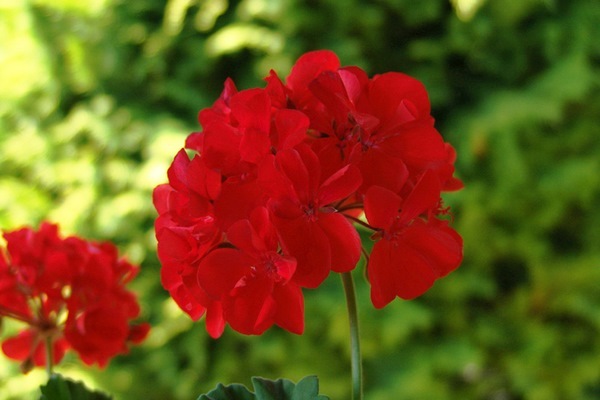 Geraniums (Pelargonium) has firmly occupied many window sills and balconies as an unpretentious and beautiful plant. Pelargonium is one of the most unpretentious plants, it grows quickly, blooms well and abundantly from May to October. With proper care, pelargonium can bloom all year round. It has a pleasant spicy aroma, which is not emitted by the flowers, but by the leaves. This is the perfect hanging balcony plant during the warm period of the year. The ideal location for geraniums is a sunny balcony. It will thrive in the sun but it loves moisture and requires regular and frequent watering. Pelargonium can be combined with other species like petunia, Cuphea (False heather), Oenothera (Evening-primrose), Bacopa monnieri (Waterhyssop), etc. 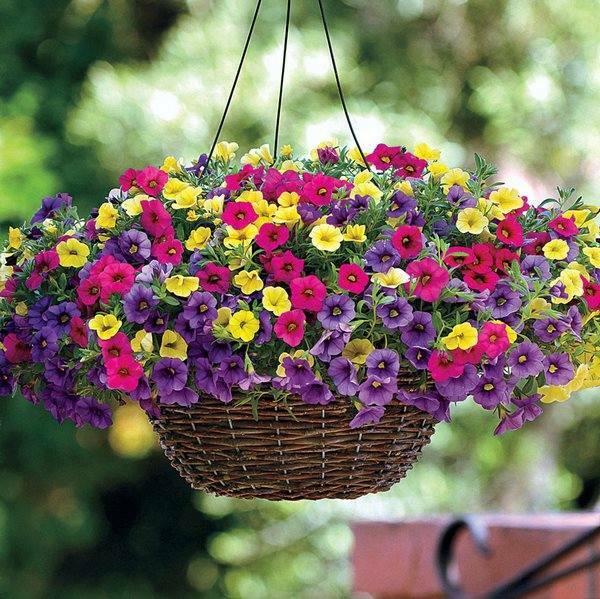 Petunia is among the most popular balcony hanging plants growing in boxes, baskets and pots. 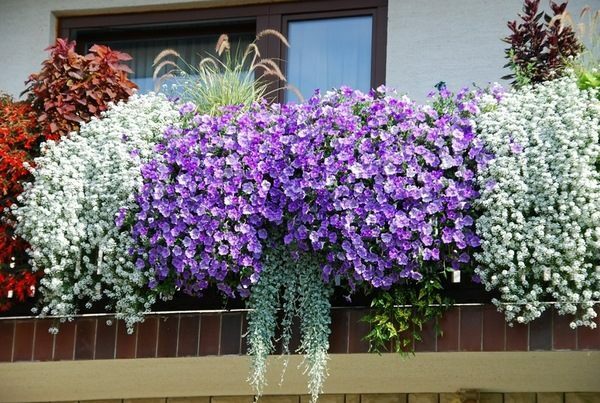 Thanks to the huge variety of colors, long flowering period from May or June to October – November, variety of types, they create a unique design on the balcony. 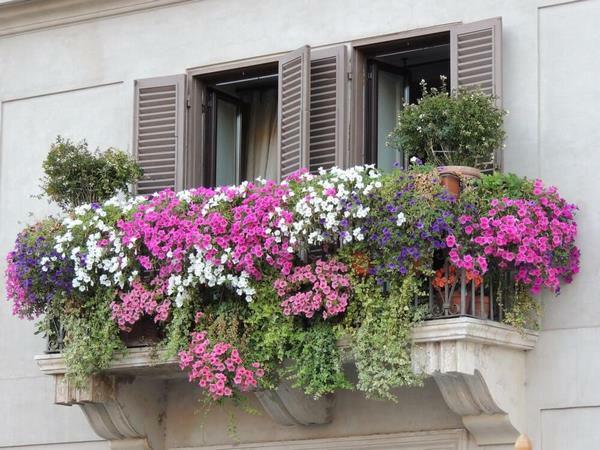 The best location for petunias is a balcony that is exposed to sunlight all day long. 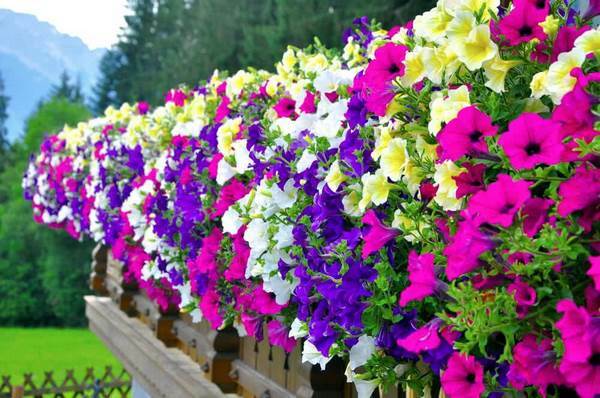 Similarly to Geraniums, Petunias love sunlight and require regular and frequent watering. Petunia has trumpet-shaped flowers which come in different colors – white, red, pink, purple, blue, etc. This plant can be combined with species like African daisy (Osteospermum), Magic bells (Calibrachoa) and Alyssum (Alyssum montanum). Calibrachoa – related to Petunia, Magic bells (million bells, mini petunias) are a great choice as balcony hanging plants. They thrive in sun or semi-shade and should be watered daily. The flowering period of Calibrachoa is from May to September and the flowers offer a huge variety of colors – white blue, purple, pink, yellow, orange, red, etc. Calibrachoa are easy to care for and unlike petunias, their petals are not damaged by rain, as they simply close until the sun shines again. 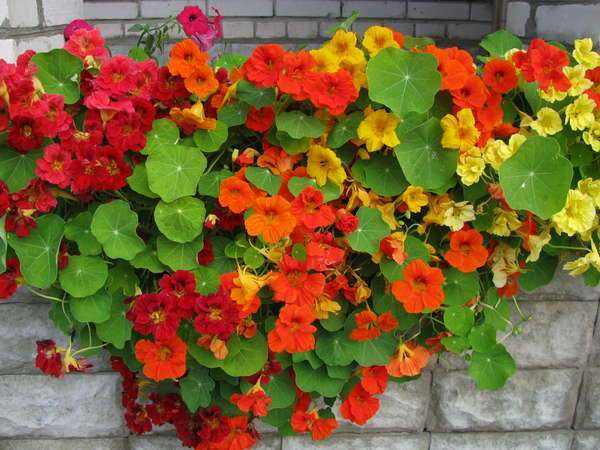 Nasturtium (Tropaeolum) blooms from July to September. 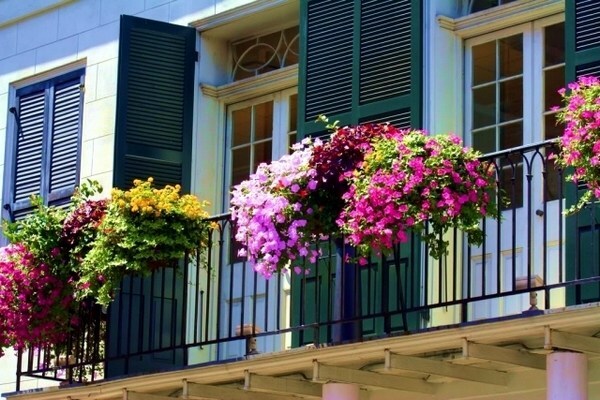 This balcony flower is unpretentious, its flowers come in a variety of different colors and there are climbing species as well as cascading varieties, which are ideal for balconies and window boxes. Fuchsias are great blooming flowers for the north balcony. 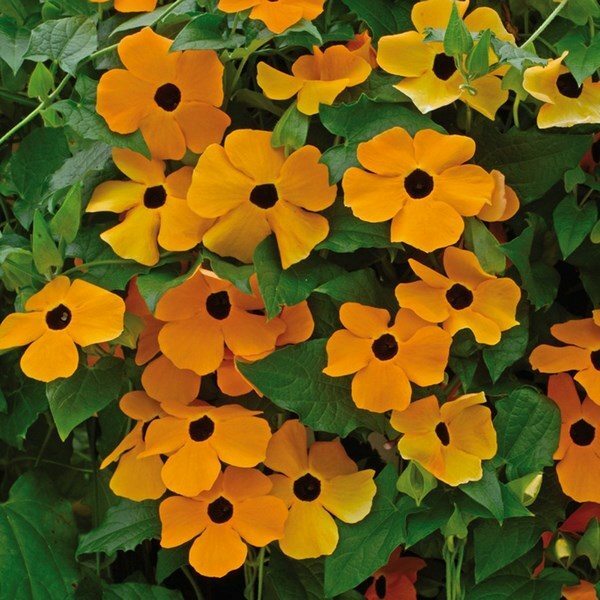 They need a small amount of light for flowering and growth and thrive well in both partial shade and on the shaded balcony. Flowering time vary depending on the particular fuchsia species but they usually bloom from June to the first frost, sometimes even to November or December. 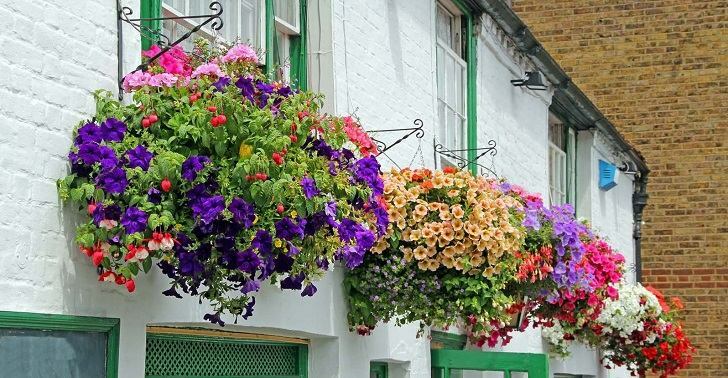 Trailing and cascading varieties are perfect as balcony flowers and look stunningly beautiful in hanging baskets. 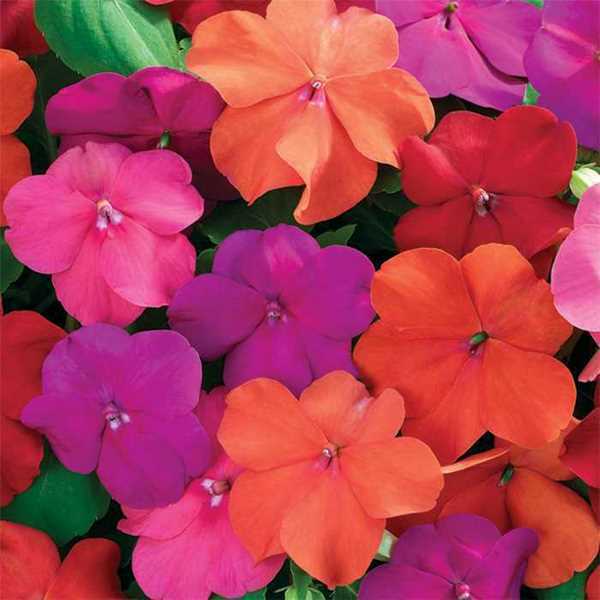 Impatiens walleriana ( busy Lizzie, balsam, sultana, or simply impatiens) is a beautiful gentle flower, flowering in a variety of shapes and colors. It is widely popular hanging balcony plant due to the fact that it is very easily cared for. 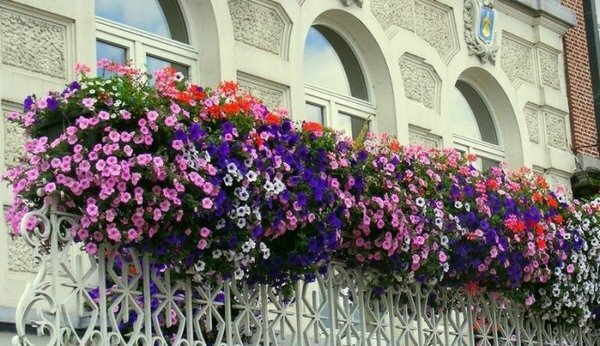 It has fascinating delicate white, pink, orange, yellow, red, purple flowers which contrast to the dark green leaves and add visual interest to the balcony decoration. Flowering period lasts from May to October. Nemesia is one of the most beautiful and colorful plants suitable for the balcony. It blooms abundantly with warm colors and many shades of purple, red, pink, blue, yellow, white, orange, etc. 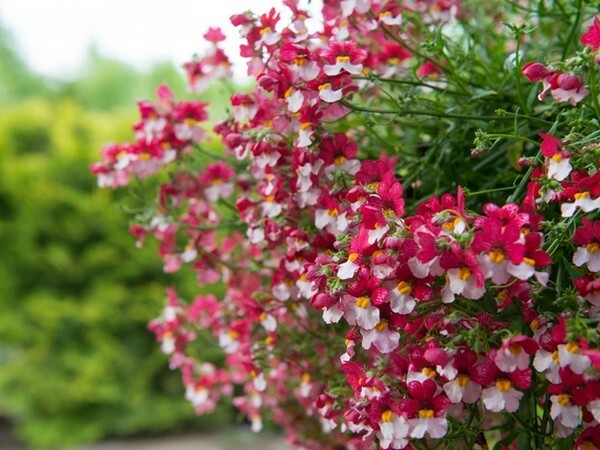 If you want your balcony to be bright and colorful, Nemesia is your best choice. It blooms from June to the end of September, which guarantees your home decoration throughout the summer. The most suitable place for Nemesia is direct exposure to sunlight. It grows well in semi-shaded place as well but it is important to protect it from drafts and strong winds. The post Hanging balcony plants and blooming flowers for a spectacular exterior appeared first on Deavita Interior design and Architecture Magazine.